A 10 week course of movement, this progressive series of Biodanza is all about giving yourself time and space to experience inner freedom of movement, enliven your vital energy and natural flow. Each week is a reset away from stress towards joy, contentment, health, freedom, satisfying relationships and enjoyment of life. A regular practice of Biodanza supports you to cultivate positive states of body, heart and mind and invites your life to open and flourish. Born in South America, Biodanza makes it easy and enjoyable to let go of the stress and busyness of the day and to move, feel, play and ‘come back to yourself’. Biodanza grew out of an appreciation for how dancing in community can fundamentally and profoundly contribute to individual and community health, wellbeing and life meaning. Grounded in the human sciences of biology, psychology, human movement and physiology as well as the arts, Biodanza is established in over 50 countries with around 3,000 facilitators worldwide. Compelling research on the effects of Biodanza have been published in scientific journals which point to its positive effect on wellbeing and health indicators including reductions in the effects of chronic stress, increases in feelings of optimism and wellbeing and improvements in immune system strength. It is great for your mind-body-heart health and is done to inspiring music from around the world. There are no steps to learn, nothing to get right; just a progressive series of movements to cultivate positive states of body, heart and mind. Each week is a reset away from stress towards joy, contentment, health, freedom, satisfying relationships and enjoyment of life. 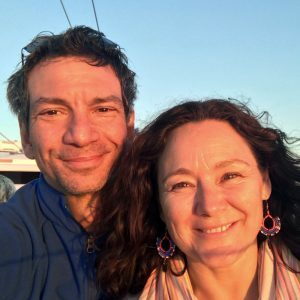 Instructors Claudio Gomes and Kate Clement trained in Brazil, South Africa and Australia as dance and Biodanza facilitators. They each bring 20 years of Biodanza experience into their teaching. Kate is also a Director of the Biodanza School of Australia and conducts the 3 year facilitator training in Australia. The entire course is transferable but non-refundable. It is only valid for the dates specified. To book, please email va@biodanza.com.au. Bring a bottle of water and wear clothes comfy for moving in (e.g tracksuit, shorts or leggings). We invite you to dance barefoot if that is possible for you. For more details, visit the Biodanza website, email va@biodanza.com.au or call 0498 006 131.